Resilient though it may be, vinyl flooring isn't invincible. Fortunately, you don't always need to replace the installation if it gets damaged. Plenty of homeowners have fixed unsightly, trip-triggering tears with this clever, inexpensive trick. 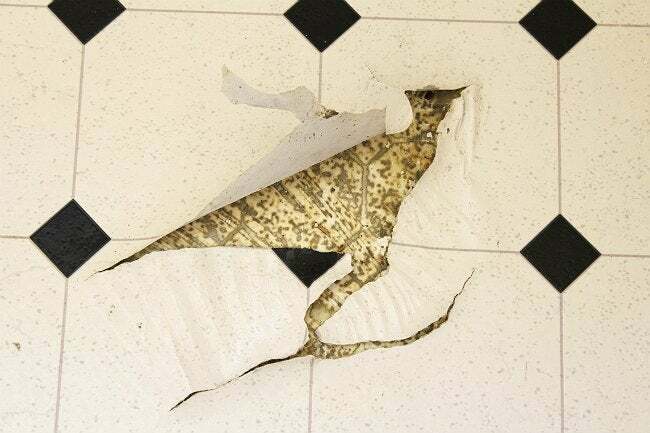 If your vinyl flooring (or linoleum) has developed a tear, don’t despair! There’s an easy—and yes, rather unexpected fix—virtually anyone can perform. Here’s how it all works. Plug in a hair dryer and switch it to the medium setting. Using a steady back-and-forth motion, warm the damaged area until the flooring feels pliable. Next, gently stretch both sides of the tear inward to close the gap. After that, apply acrylic cement beneath both sections of the torn flooring. For the best adhesion, apply the cement directly to the wood subfloor, if it’s possible to do so. Once you’ve put down the glue—and before the stretched flooring gets the chance to cool and contract—place a heavy object (e.g., a cinder block) over the repair. When you remove the weight, a thin gap may still appear in the material. If so, head to the local drug store and purchase some nail polish in a color that closely matches the flooring. You may need to brush on several layers of polish, but in the end, you’re likely to be the only one who knows about or notices the patch.